How does your kitchen window herb garden grow? Out of your own recycled glass bottle, thanks to the folks at Urban Leaf. Pop one of the smart soil inserts and included seeds into a water-filled bottle, place it in a window, and the herbs are ready to grow. They even water themselves for the first 30 days. Dimensions: 5.6" x 3.6" x 1.1"
If you want to grow a kitchen window herb garden, but think you don’t have the time, the skills, or the space, the folks at Urban Leaf have come up with a creative solution. 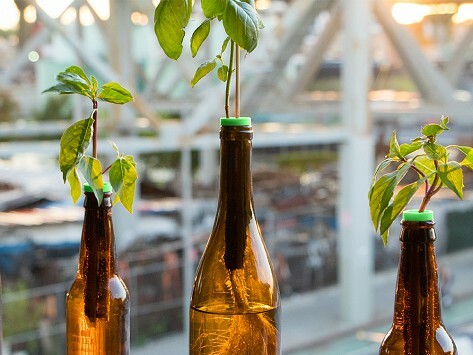 All it takes is their smart soil inserts and seeds, a recycled dark glass bottle, and a window to get growing. Makers Nate Littlewood and Rob Elliott share a passion for urban gardening and reconnecting people with food. They want to make it easy and fun for people to start growing their own herbs, even in the smallest spaces, like their own New York City apartments. These inserts are about as low-maintenance as you can get, because they give the herbs all the nutrients they need to keep growing for up to six months. They even water themselves for the first 30 days—how easy is that?